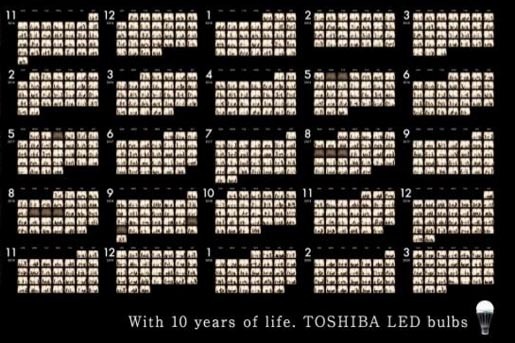 Dentsu Tokyo in Japan has won a Gold Outdoor Lion at Cannes International Festival of Creativity for “With 10 years of life”, an outdoor advertisement for Toshiba LED bulbs. Apartment block windows are set out as days of the month, lit up over 120 months. Click on the image below to see the full ten years. The 10 Years of Life ad was developed at Dentsu, Tokyo, by creative director Masumi Nakazawa, art director Tsubasa Adachi, copywriters Junpei Iwata, Yuichi Kitada, Sayaka Arimoto, account manager Atsushi Utsunomiya and photographer Shingo Fujimoto.